Why it’s vital to have a system to track restaurant costs…now more than ever!!! The current economic downturn has caused many good, quality restaurants to go out of business. With food costs, employee theft, and employee costs on the rise, restaurants without good systems in place are left wondering what happened to their profits. Increasing Costs Means Lower Profits!! The current economic downturn and rising food costs have forced restaurants such as Uno Chicago Grill Pizza, Charlie Brown’s Steakhouse, and Fuddruckers to file for bankruptcy in the past year. Overall food prices have increased by 3.9%...The biggest jump since 1974. Wheat prices have increased by 60% this year. Because of the increase in the price of corn, used as feed by farmers, the prices of beef, chicken, pork and dairy are expected to see the largest increases. With the new health-care law, restaurants now face another cost that must be managed. Restaurants with 50 or more full-time workers now must provide health insurance to employees who work over 30 hours per week. A typical US business will spend $6000 to $7000 per employee. However, restaurants on average make only $2000 profit per employee, each year. Any restaurant found in violation of the health care law may pay a penalty of $2000 to $3000 per worker. According to the US Chamber of Commerce, 75% of all employees commit some form of employee theft. Many will do so repeatedly. Research done by Employee Theft Solutions, a division of The Shulman Center for Compulsive Theft and Spending, estimates that employee theft causes ⅓ of all US corporate bankruptcies. Small businesses with 100 employees or less have the greatest risk for employee theft. This is because small businesses normally implement fewer anti-theft controls than large businesses. A typical business will lose 5% of its annual revenue to theft. Dan Cosgrove, CEO of Mercantile Systems, Inc has identified six signs to look for when determining if your business is a victim of employee theft. Have Your Food Costs Increased? Is your cash drawer over or under consistently? Do your employee’s tips add up? Have you been told by your customers or employees that someone is stealing? Do your customers complain that your prices are too expensive or change frequently? Do your instincts tell you that something is wrong about an employee? If you answer yes to any, or all of these questions, you may be a victim of employee theft. The POS system you choose for your restaurant should have tools to manage your inventory and food costs, prevent employee theft and credit card fraud, and be flexible enough to meet your restaurant needs. Managing inventory in a restaurant can be a daunting task. If you are managing inventory manually, you could end up spending hours each month just counting condiments. However, with today's modern Restaurant POS Systems, you can reduce the time you spend managing your restaurant inventory significantly. You need to be able to see all food costs and profit margins at any point in time. If you have not been measuring and tracking your food costs, it is impossible to ensure that you have the lowest food costs possible. Your POS system should have multiple cost and profit margin reports to give you an accurate view of how much you are spending on inventory. This would involve entering in an initial count of all products you would like to track. Also, you would need to define which items are removed from inventory when an item on your menu is sold. For example, if someone purchases an omelet, you would need to program the system to not only deduct eggs from inventory, but also cheese, any toppings, oil, etc. With most systems, this is done by defining a food recipe in the system. In the recipe, you would specify all of the ingredients that make up the menu item. When the menu item is sold, all of the ingredients are removed from inventory. With many restaurant POS systems, you also have the ability to create purchase orders for your vendors. For example, when you are out of eggs, you would generate the purchase order for more eggs. When the eggs come in, you would let the system know that the eggs have arrived, and the system will automatically add the eggs into your inventory. This method of adding inventory would be much more efficient than any manual method. To speed up the process, many systems can auto-generate purchase orders. For example, you can setup your system to create a purchase order when you are down to four dozen eggs. Again, when the eggs come in, they will be automatically entered into your inventory. The time you gain in making your restaurant inventory process more efficient could be quickly lost if you have to manually input this information into your accounting system. Be sure that the POS system you purchase can automatically make adjustments to your chart of accounts in your accounting system. One final aspect of a modern inventory system is accounting for food waste. Again, using our eggs example, if someone dropped a dozen eggs on the floor, in most modern POS systems, you can quickly enter this in as food waste. Your POS system should include functions to prevent employee theft. This includes manager passwords and manager swipe cards. You should also see when those manager passwords were used in your reporting. For example, if a manager approved a void, you should have a report in your POS system that shows the name of the employee that performed the void, and the name of the manager that approved it. In 2007, Heartland Payment Systems had a security breach of close to 100 million transactions by hackers. In 2008, RBS Worldpay announced that there was a security breach of their payment systems that may have affected 1.5 million people. In 2005, a security breach at CardSystems Solutions compromised 40 million debit and credit card accounts. To combat credit card fraud, the Payment Card Industry Security Standards Council required that all POS vendors comply with the Payment Card Industry Data Security Standard (PCI DSS). This standard protects card holders by ensuring that POS systems meet a minimum level of security when they store, process, and transmit credit card information. Be sure that any POS system you purchase is in full compliance with the PCI DSS standard. Have your systems been certified for PCI Compliance? Do you store credit card information in your POS software? If so, how do I protect my systems from credit card fraud? The POS System you purchase needs to be flexible enough to accommodate your restaurant’s needs. Any system that claims to be a “one size fits all system” normally ends up as a “this size does not fit me” system. Be sure that the vendor has a trial version of their POS software you can download so that you can make sure the system will work for you before making a purchase. You also need a system that will grow with your business. If you move to another location, or, you need extra POS terminals to keep up with your restaurant’s growth, the vendor you select should allow for easy relocation and expansion. 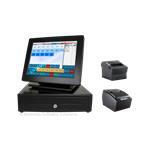 The POS system you purchase should be flexible enough to accommodate a variety of hardware. You shouldn’t have to rely on purchasing the most expensive computers, printers, and cash drawers to get your system up and running. A restaurant manager or owner needs to be able to see a complete view of his business at any point in time. Food Costs, Wastes, Voids, Discounts, Comps, Expenses, and Labor are just some of the metrics that you need to be tracking on a consistent basis. Having access to this information allows you to make better decisions concerning purchases, employee scheduling, or even whether to fire someone for stealing. Your POS system should include detailed reports to give you a full view of how well your business is performing. 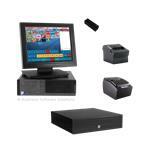 The POS Vendor that you choose should offer a variety of support services. Call 801-336-3303 for questions or custom configured systems. Where Can You Find A Restaurant POS System That Has All Of These Features? Here at Business Software Solutions, we provide Restaurant POS systems that help you control your inventory and food costs, prevent employee theft and credit card fraud, and manage your restaurant all in one package. We include all of these features so you can focus on keeping your business profitable and save valuable time on management tasks. Our Business Plus Accounting software is included free on each Point of Sale terminal you purchase from us. Rather than making an expensive software purchase up front, you pay nothing up front and a very reasonable fee of $30 per month for support, upgrades, and software licensing. Speak to a Technician for support on any of our software products or Hardware setup/configuration. Free support is provided for our customers who are current on their monthly support/licensing fees. Want more information about our systems? We want you to be sure that our systems will work for you. So, we encourage you to download a full featured 45 day trial version of our BPA Restaurant Pro POS Software. You can also call us at 801-336-3303, or email us at sales@businessoftware.com with any questions you may have. Finally, if you would like to chat with a representative, click the “Chat with a Salesperson” button below.